Washington D.C. [USA], April 14 : Good news! Kill depression with 'Chia', says expert, while adding that the superfood is one of the richest sources of plant based omega-3 fats that may help in bringing positive mood in people. Depression has not been taken with much seriousness for long, due to social stigma or lack of awareness and diagnosis but is now an acknowledged malady that affects growing numbers of people across the world. Prof. Ram Rajasekharan, director, Central Food Technological Research Institute says, "one can add about three-gram 'Chia' to a glass of water and allow the water to rest for about 10 minutes; the seeds form a transparent gel that can be easily consumed." "Seeds can blend well in into fruit juices, smoothies, shakes, buttermilk, puddings and bakery products like bread and cakes. The neutral taste of the seed helps in seamless blending into all food products. On an average, an adult needs about 1-1.6 gram of omega-3 fat daily," Rajasekharan added. Sometimes environmental situations can trigger a genetic predisposition and cause the onset of depression. Foods rich in omega-3 are fish and a few plant produce. Chia is one of the richest sources of plant based omega-3 fats for vegetarians. Chia is an ancient grain and was an essential part of the Aztec culture with a presence in their religious practices, daily food and special foods as well as food for the ancient Aztec warriors. 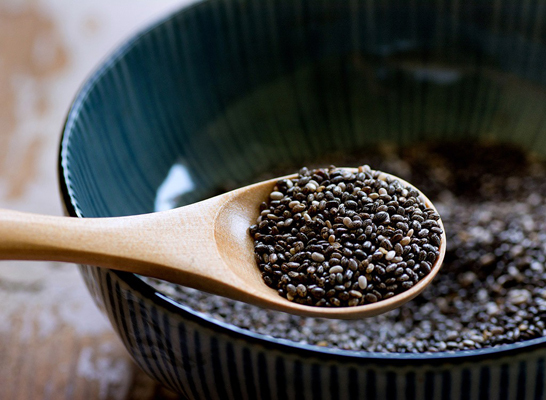 "Chia seeds occurs in nature in black, mottled and white forms with white seeds having an edge over the rest. Due to its high import costs, superfoods have been inaccessible to a majority of consumers in India leave alone the common man. However all that may be about to change," Rajasekharan explained. Chia seeds do not require post-harvest processing and can be directly consumed after harvesting and cleaning. Chia upon adding to water becomes a gel that is easy to drink.